June 15, 2017, 10:00 a.m.
Last month, Christian Aid launched its new TV advert in an effort to promote the charity’s annual fundraising drive. The video, urging the public to stand in solidarity with refugees, focuses on Theodore Davidovic from Serbia, a former refugee recalling his time post-World War II. It looks back at Christian Aid’s history, its involvement in supporting refugees in the Second World War and it also showcases their current work in helping people to flee conflict and disaster around the world. YouGov CharityIndex data indicates how successful the campaign has been. 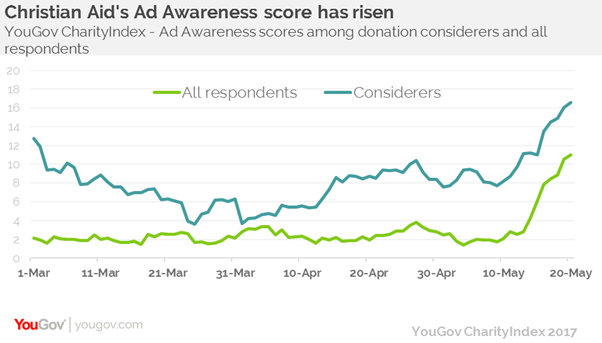 Among all respondents, with its Ad Awareness score (whether or not you have seen an advert for the charity in the past two weeks) growing from +2 to +10 since mid-May. However, the Ad has achieved particular cut through with those who would consider donating to the charity, with its Ad Awareness score jumping from +11 to +24 points in the same time frame. What’s more our data indicates that the charity’s overall perception has risen. Its Index score has gone from +5 to +10 in the space of two weeks. The data also shows that people are also more likely to recommend the charity now than they were in early May, as it’s recommend score has grown from +5 to +9 throughout the end of last month and into June. YouGov Profiles points to one reason the campaign has been a success. Our data shows that those would consider donating to the charity are 10% more likely to watch TV adverts (48%) than the rest of the general population (38%). The key of course, is to harness this increased visibility and positivity generated by this campaign.